Bought this beautiful plate from the famous Chatuchak weekend market for INR.90 (unbelievable). wanted to buy many more but with a nagging kid and sleep deprived husband you cant shop. I want to go again just for shopping. Our Thailand trip was an eye opener for me in many ways. I was not too excited to go abroad for a relaxing trip because I still believe that we have plenty of beautiful places to explore in our own country. Though for work and for passion I have traveled extensively in and around some parts of India yet there’s no dearth of beautiful destinations in India. But hubby wanted to go and his point was that he would mostly be not reachable by his office (liar) and could finally relax the way he wanted. But the time I touched ground in Bangkok I fell in love with the city. Warm and cozy like my own country yet different and developed in many ways. The aspect that I loved most of Thailand is its people. Such generous, happy, friendly and smiling faces uplift the mood automatically. They are always eager to help you out and treat you well. They will recognize you even if they have met you just once and come and greet you with their warmest smiles. Some of the girls in the restaurant we frequented loved my son so much that they arranged for kid’s food by going out of their ways. Not to mention the friendly ladies in the spa who fed the kid and kept him busy when we soaked in the luxury. People here are very relaxed, happy and enjoy their lives. It’s a joy to watch flocks of students, batch of office collegues or a group of working moms catching up animatedly in the sky train or on the roadside eateries. Not like in my part of the World where a day in the office leaves people feeling frazzled. Another thing I fell in love with is their sense of beauty and aesthetics. Not only Thai woman are pretty, well dressed or well maintained but they maintain their surroundings really well too. Even the tiniest apartment is surrounded with beautiful plants and tropical flowers. Minimalist yet everything clean and neatly arranged. Most of the shops be it the roadside carts or big super markets are run by women and I watched once how vigorously they clean their places once the day is over. Thailand or Bangkok more specifically is a cosmopolitan city in all its true sense. Its like a melting pot of various cultures, which makes you feel safe and secure. . Even a young girl can easily go around late in the night without being hassled or troubled. Someone told me Thais rarely steal or cause any problem and I believe that totally. We left our luggage at the pier without proper locks and nothing was stolen. Though the pace of life in Bangkok is very busy still it’s an easy city to live in. . with the numerous modes of travel especially the sky train and Metro, going in and around the city is extremely cheap and easy. for places which is not touched by them there are ferries, taxis, buses and Thailand own Tuktuks. There are plenty of things to do and everything is very very convenient. If you feel hungry in the middle of the night you would find numerous shops to serve you out of the wok hot food. With so many bars, restaurants, pubs, food joints, pharmacies, supermarkets, night markets you always have something to do no matter what day or time it is. And everything is so cheap compared to even India that you are spoilt for choices. There’s global food chains, Indian restaurants, Thai food joints, Indian and Hollywood movies, International brands you just have to choose from numerous choices. I often feel like going out (when parents are here) after putting the baby to bed. That’s the most convenient and leisurely time for me when I can enjoy myself without worries. But by the time he goes to bed the shops or restaurants here are done for the day. And finally its more desirable to me because of its proximity to my hometown. We have a fixation to stay close to our family for which we never took the offers that could given us the sought after opportunities of living in some very developed countries. But with Bangkok the story is different. Its only 2 hrs flight away and we are already planning our next holiday…. 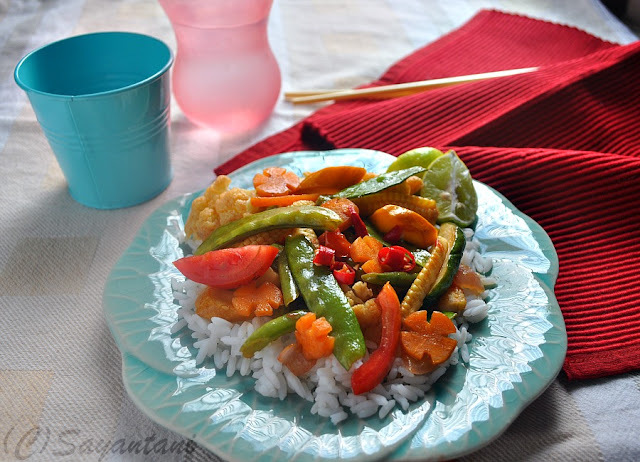 The stir fry recipe that I ma sharing here is very common in Bangkok and we almost everyday had it with rice and other yummy stuffs. I knew I would have to replicate this back home so on my last day there I spent close to 4 hours in the Villa market and bought things that we hardly get to see here. I even brought a bag each of organic snow peas and sunburst squash. The stir fry recipe is very versatile you can add any vegetable or even chicken or tofu and can also adjust the seasoning as per your choice. After a couple of trials I reached this recipe, which is very close to what we had there, and everyone in the family loved it. We love it with some juices that the vegetables release, if preferred you can dry this up. But what you cannot do is losing the crunch. The dish is very good in itself as well. I love having a bowl of this stir fry with some bits of silken tofu in it for my lonely lunch. And when I do that I save myself the time to cut the carrots in flower shapes. The knife skill in the picture is just the inspiration that I bought home from the amazing vegetable carvings Thai people do. Slice the onion in thick long wedges. Thickly slice capsicum and baby corn. Wash, peel and thickly slice the carrots diagonally. Wash and do the same with zucchini and cabbage. Divide the cauliflower and broccoli in medium small florets. Chop off the ends of snow peas and discard the string. Cut beans in 1” pieces. Cut the tomato in thick wedges. Heat the oil in a kadhai or pan. Take some utensil that has a wide bottom with space to move the vegetables. Let the wok become very hot so that when the oil is added it starts to smoke immediately. Keeping the flame on medium high start by adding onion, chillies and garlic. Fry only for a few seconds till the aroma rises. Followed by the hardest vegetables like cauliflower, broccoli, carrots and beans first. Fry for a minute or so till they start releasing the juice. Then add all other vegetables depending on the time they need to get cooked. Lastly add the snow peas and tomato. Once all veggies are added mix in some salt and pepper powder. Add less salt as the soy and fish sauce is quite salty. Keep tossing for a minute then add vinegar, sugar, oyster and light soy sauce. Mix everything together so that it’s coated with the juice and sauce. In case the veggies are not very fresh try adding 2-3 tbsp water at this stage. Keep on moving the vegetables with a spatula so that they get the heat. finish with the fish sauce. Finally cover for a minute and let it cook. 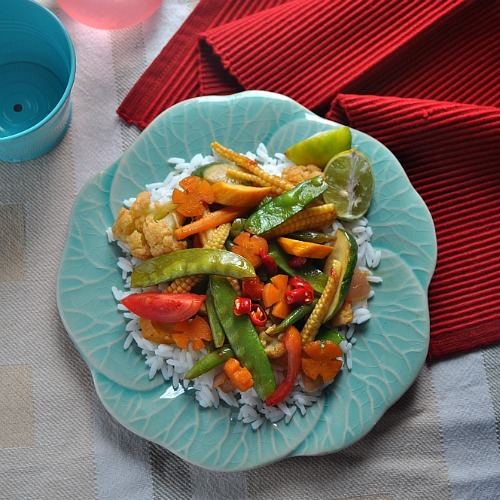 Switch off and serve with steamed white rice. For any stir-fry recipe a wok works best where the sides are fanned out and the vegetables get plenty of heat. In case you don’t have one try using a frying pan but keep the heat high. 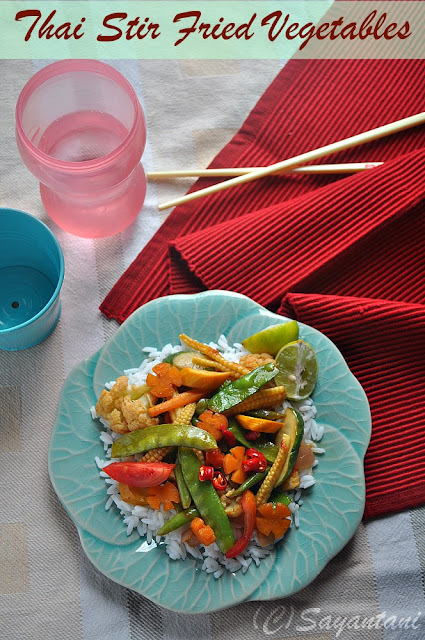 You can sprinkle the stir-fry with sesame seeds (dry roasted) before serving. Also sesame oil could be drizzled at the end of the cooking process for extra flavour. This is one of those easiest dishes where achieving the sweet-sour-hot taste balance is very difficult. Increase or decrease the sauces to achieve the taste you like. you can substitute the oyster sauce with mushroom sauce. For easy preparations you can also use store bought stir-fry sauce. In that case don’t add oyster or soy sauce rather use little bit water to thin out the sauce. Sending this to Cuisine Delight's Lunchbox ideas. Ayeesha's Healthy morsels; Pregnancy series. I absolutely love love thai food and can live on it !! 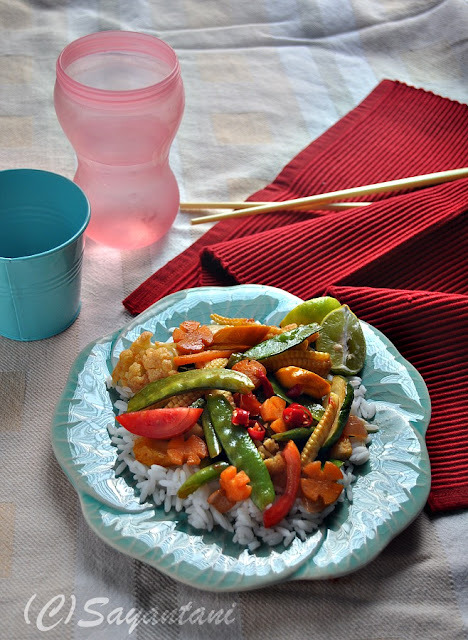 love the stir fry and the cute plate. You shld share come pixs of your trip !! loved the bangkok story! Now I want to visit it too! Lovely write up Sayantani...I totally agree about the girls there, they are smiling all the time !! And there are so many women there, right, the ratio is the other way round compared to India I think ! 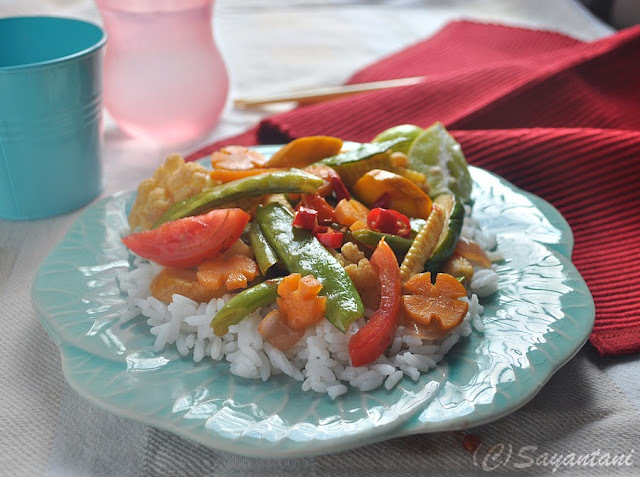 I love Thai food and this is a nice and colourful stir fry ! Is that plate also from Thailand ?? Its beautiful !! Beautiful description of the people and place. In luv with Bangkok after reading ur post ...... mee too wanna go there now :) The stir fry looks gorgeous and so does the serving platter. Wonderful post and wonderful dish!! @Nisha, thanks for your comment. I loved Bangkok for many reasons and one of them definitely is the women power. planning another vacation there with parents for which I would be needing some info. will contact you before that. @Arch, thanks, yes the plate is from Bangkok's chatuchak market. Hi Sayantani, Thank you for those wonderful words. Even you have got a wonderful space. Especially I loved all those sweets posted here like Nolen Gurer Sandesh, Aam Sandesh etc. Till now I use to buy them from Sweet Bengal, but now under your guidance, I can make them at home.. Thank you so much. Glad to follow you!!! Healthy colorful stir fry. Thanks for linking my event. Not only did you bring back wonderful memories of your holiday but a recipe to share with us too! Feel like going to Thailand. I ve heard of Massage - seems they are quiet awesome! The stir fry is simply delicious and plate is quiet attractive! 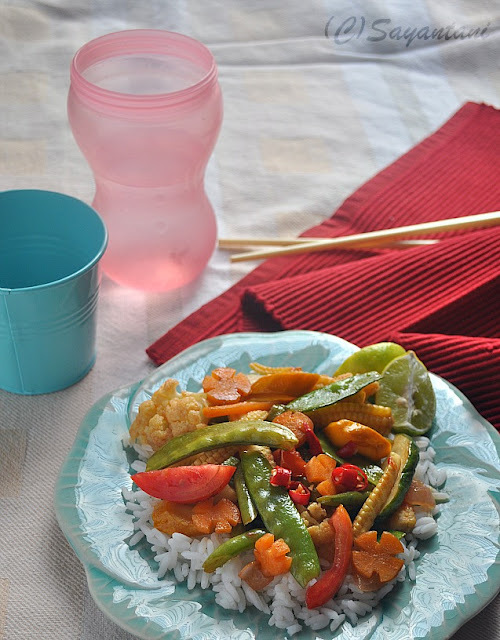 Delicious vegetable stir fry. Nice account of Bangor and Thai culture. Plate ta ki shundor! And that is a lovely recipe. I loved visiting Thailand and Thai food is my all time fav ! looks so delicious..awesome presentation dear!! Great write up. Love the veggie.